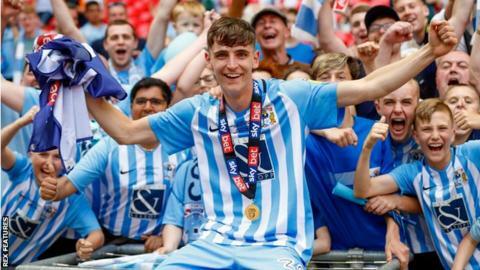 Coventry City midfielder Tom Bayliss has signed a new four-year contract with the League One club. The 19-year-old academy graduate made 32 appearances for the Sky Blues last season, helping them secure promotion via the League Two play-offs. Bayliss, an ever-present so far this term, also earned two caps for England Under-19s at this summer's European Championships. The new deal keeps him at the club until the summer of 2022. Meanwhile, Coventry have confirmed striker Jordan Ponticelli will be out of action for three months after sustaining a broken metatarsal while on loan at Macclesfield.